Factory swaybar links are a weak 3/8" in diameter in the rear, and 1/2" in diameter in the front. The weakest link of the Jeep Grand Cherokee's suspension is the sway bar links due to the lack of diameter and lack of strength. 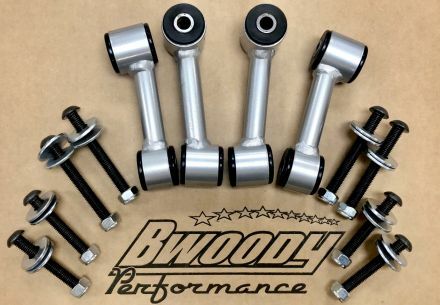 Our BWoody swaybar links are 7/8" in diameter in the front and 7/8" in diameter in the rear (nearly double the size of OEM) and include custom energy suspension bushing to improve handling even more! Significant improvements in handling were felt on our test vehicles. Time to make your vehicle handle like it should!!! Installation Requires the use of a non-washable synthetic grease (such as a marine grade or a never seize lubrication on the faces of the bushings for increased life of the bushings) upgrade to grease fittings below to expand your bushing life, and make lubrication easier! You can purchase replacement bushings HERE. Standard colors will be wrinkle black or silver you can upgrade to a different color by selecting from the drop down box below. Note: Custom colors are non-returnable. Item as describes, good quality very fast shipping. Highly recommend. Great sway bar links! Thanks for the attached magazine it's very interesting!